Now that I am older, I am less afraid to speak my mind, and I do. I have been threatened and told to shut up for stating my opinions, but I realize I am still lucky to live with the protection of free speech in America. 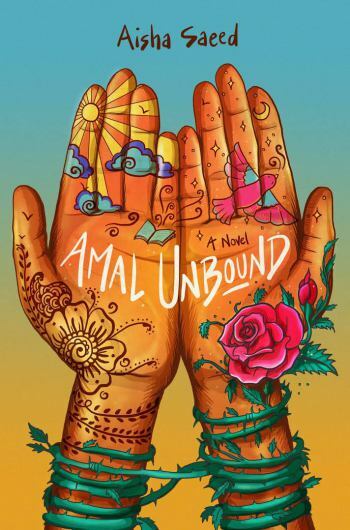 Author Aisha Saeed's new book Amal Unbound is a featured read for Global Read Aloud 2108. The book is a fictional account of a young girl in Pakistan, who speaks up and pays the price. Author Aisha Saeed takes inspiration in this novel from the real-life experience of Malala Yousafzai. Her fictional Amal is forced into servitude to repay her "debt" for insulting a powerful political figure in her Pakistani village. Reading Amal Unbound will help you understand your own freedoms and help your understanding of another culture. Challenge yourself to learn a new language and new words. What is mehndi, jalebis, parathas? Learn more about the world by sharing your experiences in writing, music and art. You are never to young to change the world!